Can the Runt of the Litter be a Good Pet? 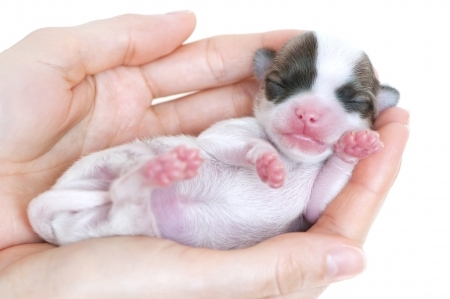 If you’re considering the runt of the litter for your next pet, do some research into the breed/type of dog and visit with the dog on at least two occasions to watch how she acts. If you have questions about her size and overall health, a check-up by a veterinarian is essential. If there is a health issue that has an impact on the dog’s size, talk to a vet about how much this will cost to treat and how much time and effort will be needed to socialize and train the dog. If there aren’t any health problems and the puppy is outgoing and playful, the runt could be the ideal pet for your family. Volhard Dog Training offers an excellent guide to personality testing for puppies. We chose the runt from a litter of golden retrievers and he grew to be one of the biggest, lived to be 14. Fourteen years! That’s really impressive for a Golden. I’m glad he brought you happiness for so long. My runt of litter is a Silver Lab that is one year old now at 91 lbs! I socialized him early on but to this day he is very possessive of his food and bones. Cannot get thru that barrier still. Otherwise he is healthy and sweet big teddy bear. We worked through all the skittish fear issues…Best looking out of the litter and best temperment dog ever!!! FeedSpot Recognizes the Contemporary Pet!